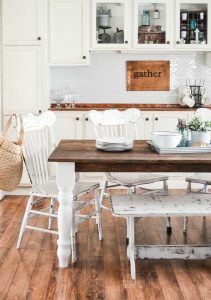 I first shared this Easy DIY Farmhouse Table on HomeRight a few months ago and today, it is finally time to bring it to you! Do you ever find a project or have an idea for a project that you just can’t get out of your head? It consumes the “creative space” in your brain? 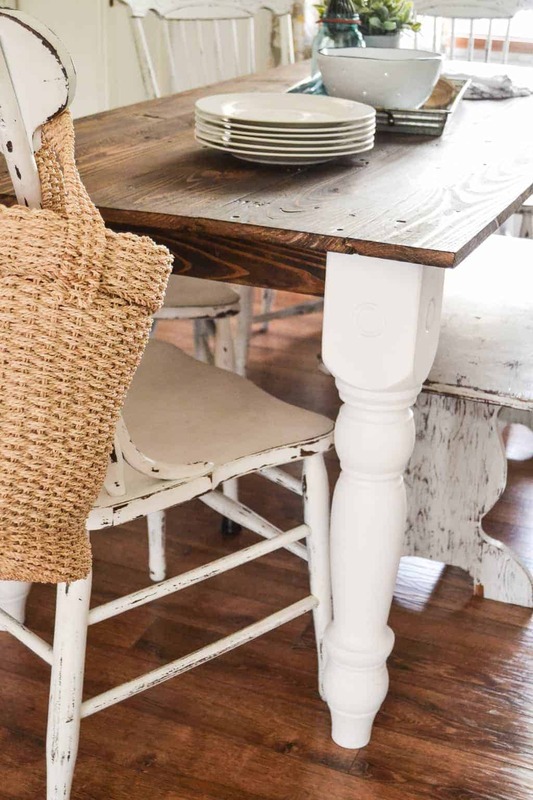 This Farmhouse Table was one of those projects for me. 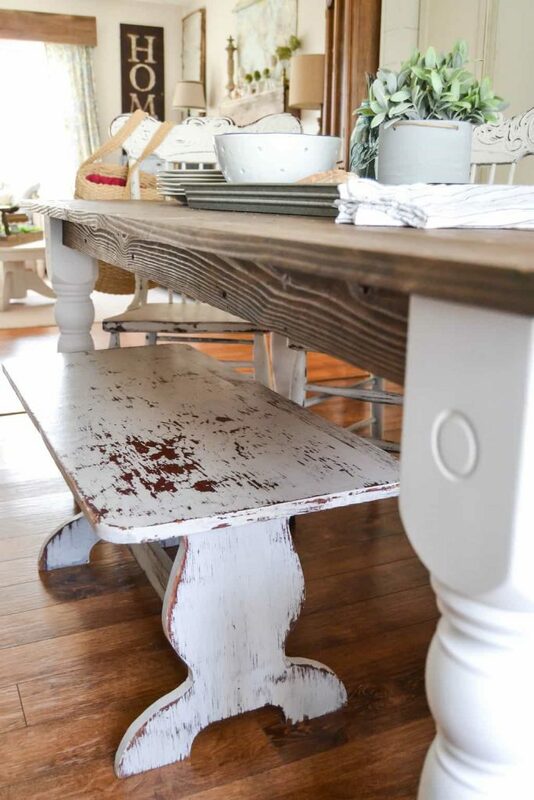 Farmhouse tables are gorgeous and I would love to own an original one some day. Until then, the DIY version will have to do. I love rescuing any piece that I know I can breathe new life into. “Pieces” can be anything from furniture to materials. 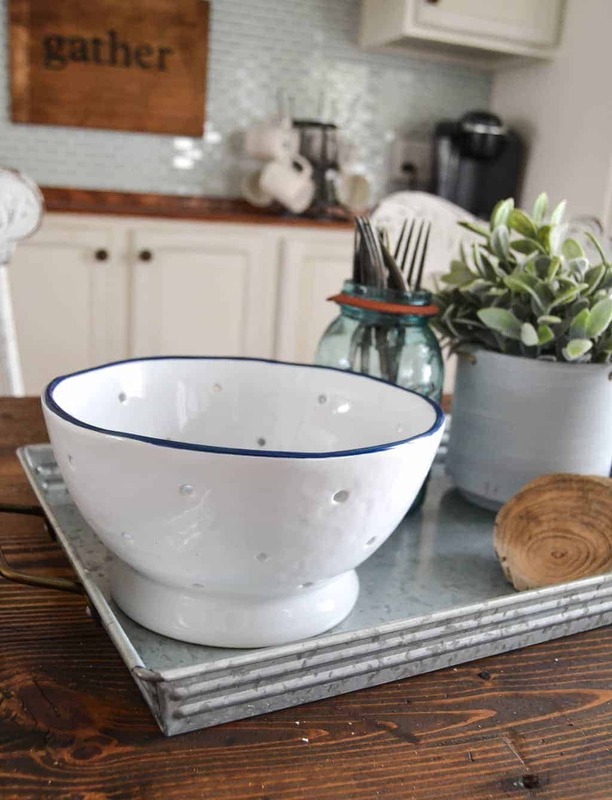 This Farmhouse Table came about with some of my favorite things to rescue and I can’t wait to tell you all about its story. About a year ago, a neighbor of ours was cleaning out their house and had a dumpster ordered. As I was passing by one day, I saw chunky table legs sticking out of the dumpster. I stopped the van and had to get out and check them out. 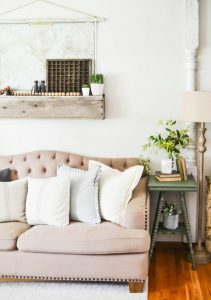 They were solid, chunky legs that I knew would be beautiful on a farmhouse table. I rescued them immediately (it’s okay, the neighbor told me to “Go for it!”). The have been sitting in our garage ever since I grabbed them last year. I didn’t want to buy new wood and add them to the legs. 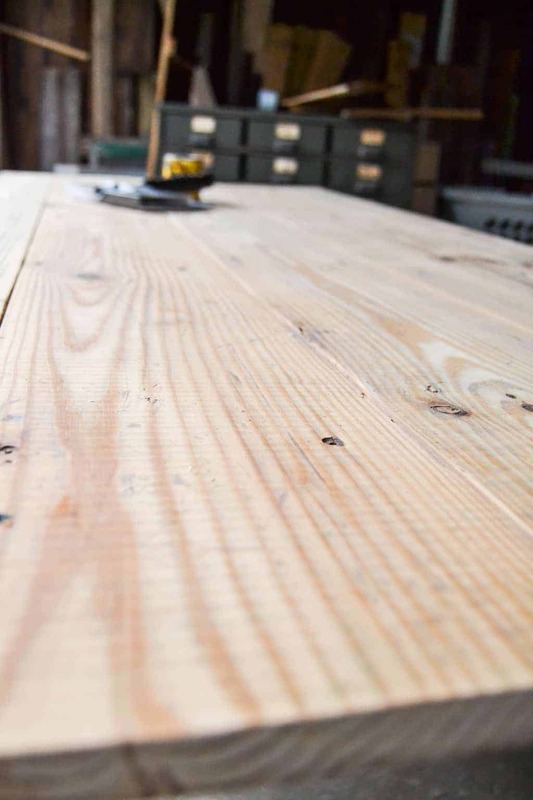 I really wanted to create a table that had character and charm by using rescued wood. Fast forward to about a month ago, when we were able to get a great deal on some tongue and groove barn wood. When we were picking it up, I told my husband that we were finally going to be able to bring the table legs to life. We had found their match and they would be supporting this amazing wood sooner than later! The barn wood had all the knicks, holes and dents that you dream of in old wood. 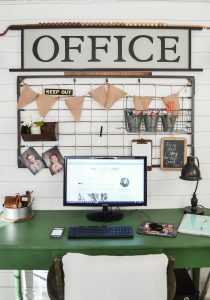 You can try to recreate this look with chains and hammers on new wood, but to have the real thing is so much better. They add all the story, character and charm to wherever you put it. 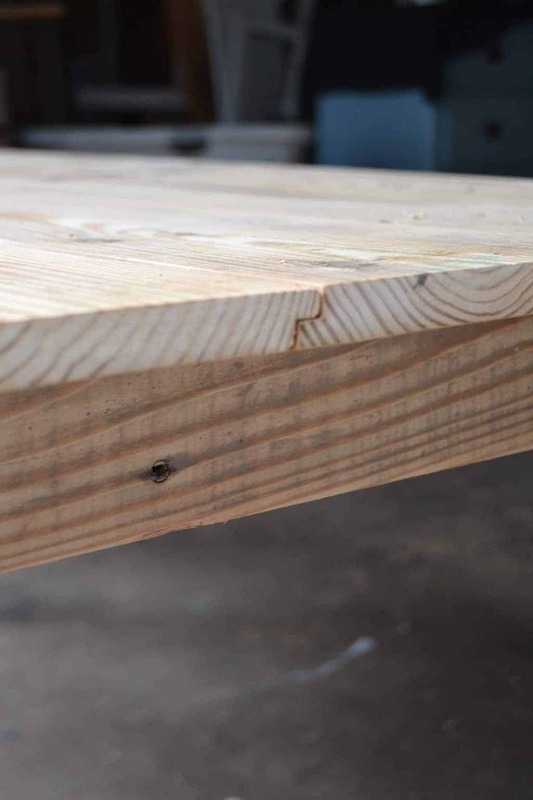 To put the farmhouse table together, we fit the tongue and groove boards together and secured them underneath and to the table legs. 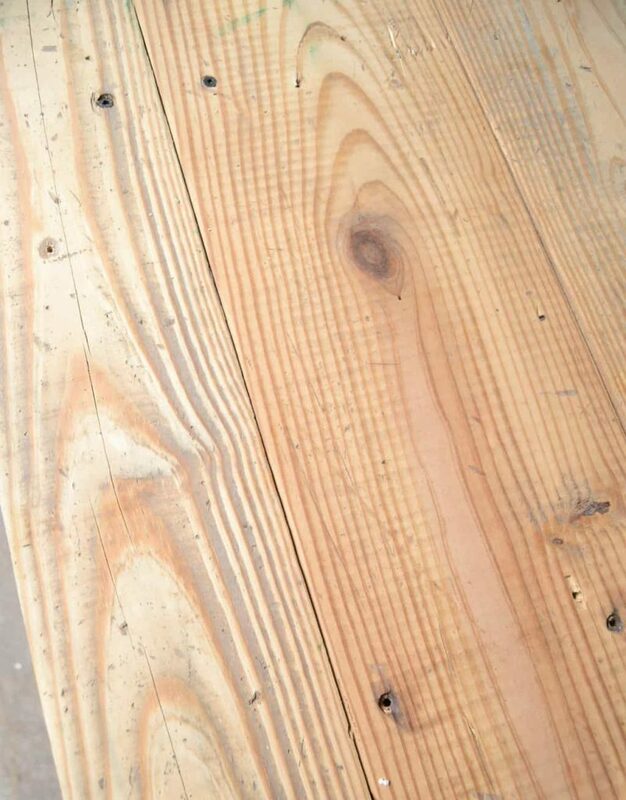 We sanded the wood down really well so the table top would be smooth. All of the character was left intact. 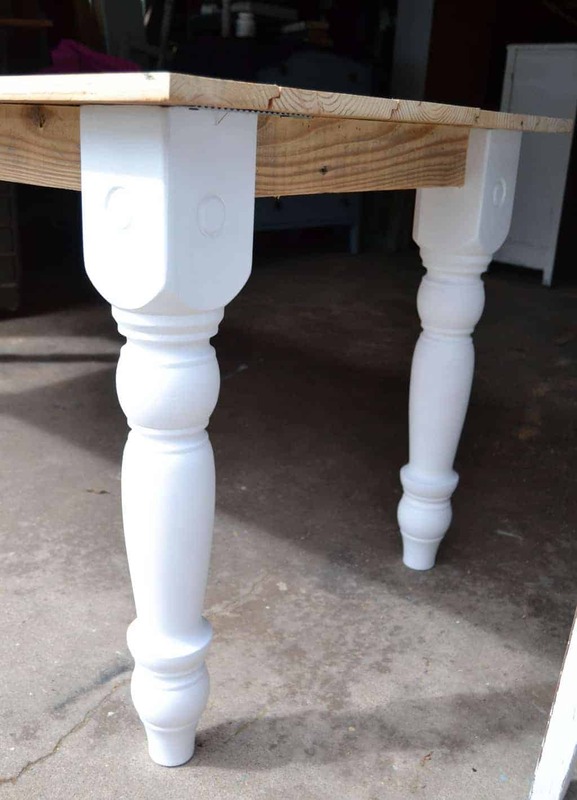 The table legs were not a crisp white when I rescued them. They were a yellow, pine color. 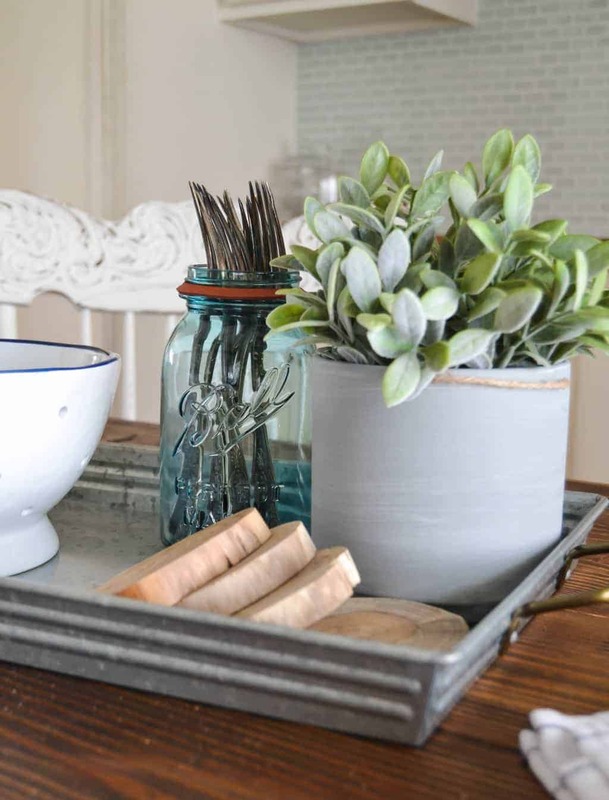 I primed and painted them white to fit the farmhouse table vibe I was going for. To make the character and charm of the barn wood come alive, I wanted to stain it. 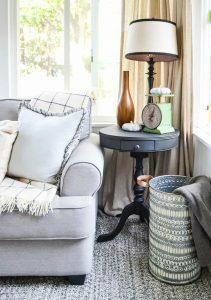 I chose “Dark Walnut” stain to give the top a rich, dark color so it stood out against the white legs. 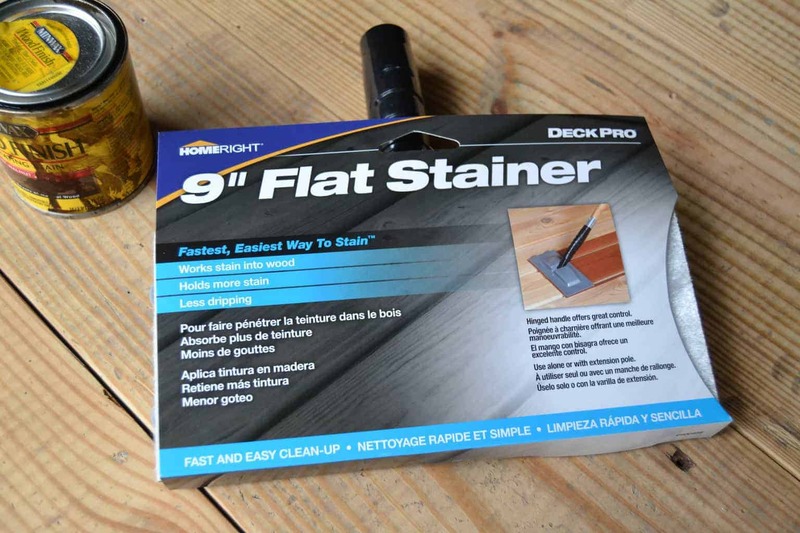 I used HomeRight’s Deck Pro 9″ Flat Stainer to make the staining process go smoothly and quickly. As soon as the stain was on the table, I knew I had the right color. LOOK AT THE GRAIN IN THE BARN WOOD COME ALIVE! This table is BIG and I knew it would take me forever to put the stain on with a rag. 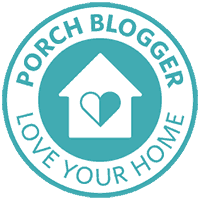 The Deck Pro 9″ Flat Stainer made the job done in under twenty minutes!!! I couldn’t be more happy with the outcome! The dark wood looks amazing with the white legs. The dark stain really highlighted all of the knicks the barn wood has. 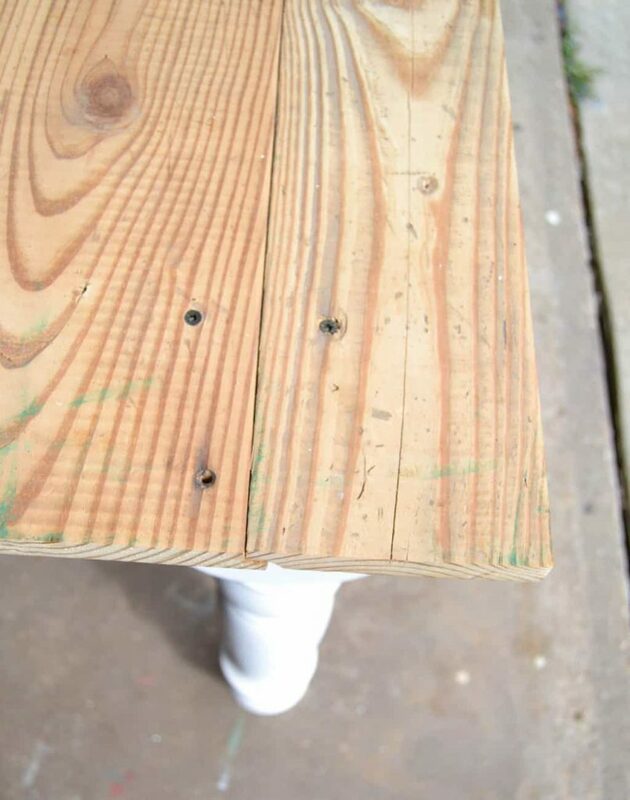 I used a small paint brush to add the stain inside the holes and the indents. I really wanted to bring them out and added this stain right too them, darkened them. 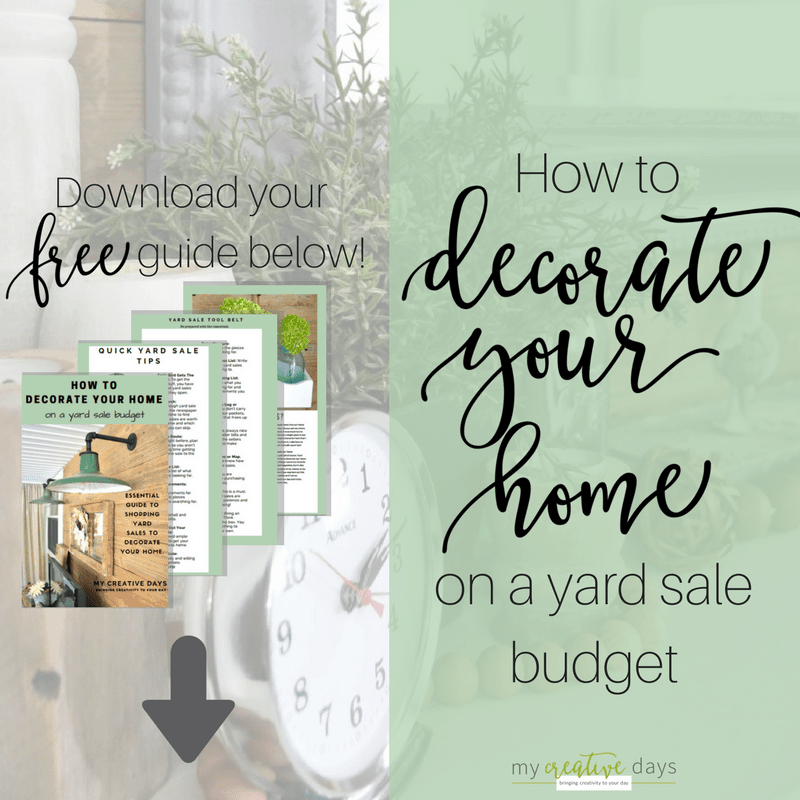 Your dining table is so important. 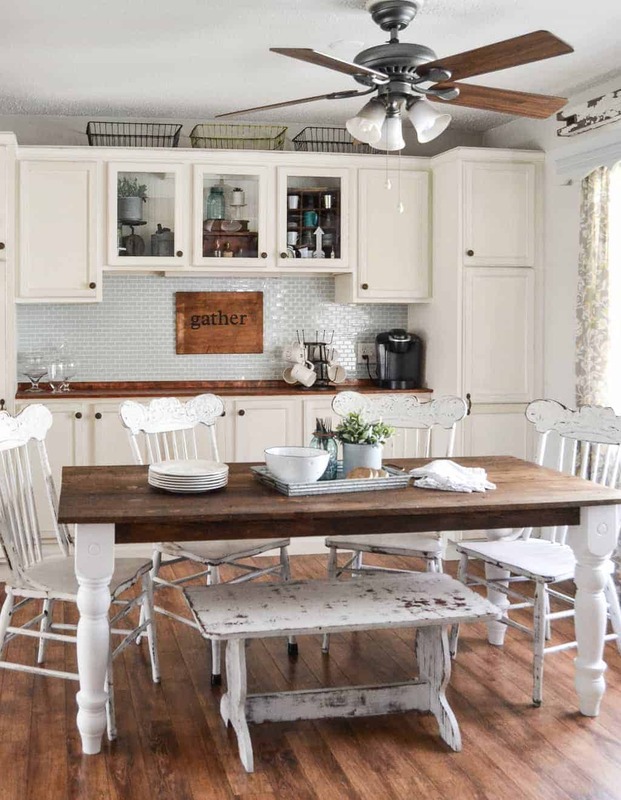 It is the one place in your home that your family gathers at. It holds a lot of memories and makes new memories every day. 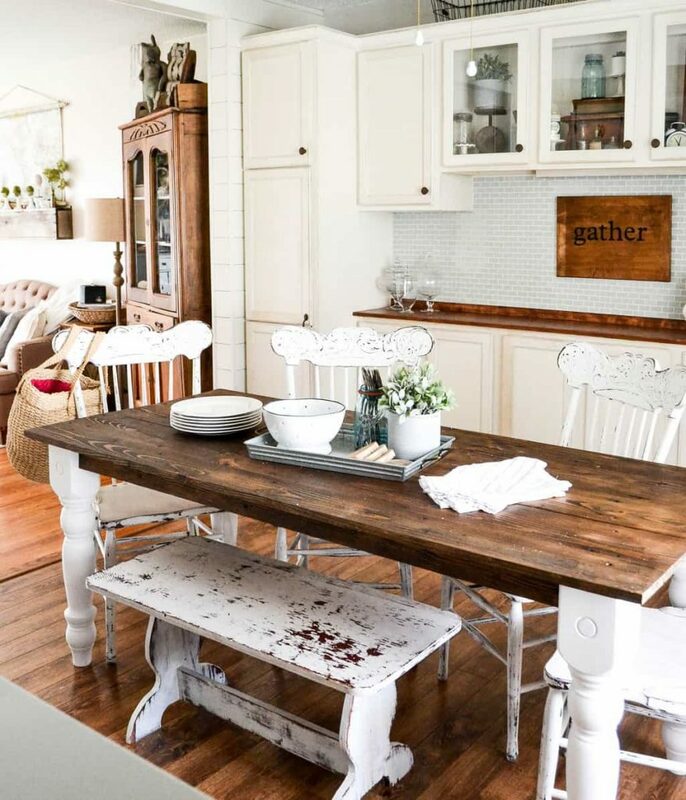 To have a farmhouse table with so much history and character only adds to those experiences. 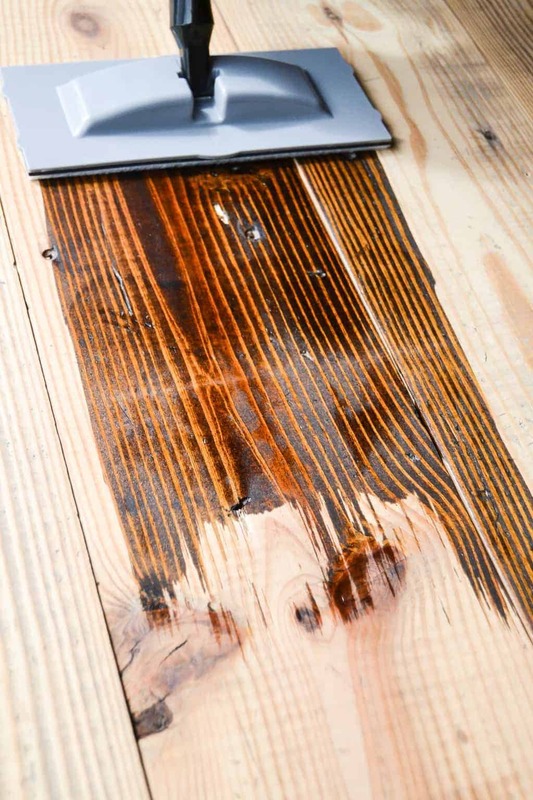 If you have larger projects like this to stain, using one of HomeRight’s deck stainers is the way to go. Your project will be done in no time! 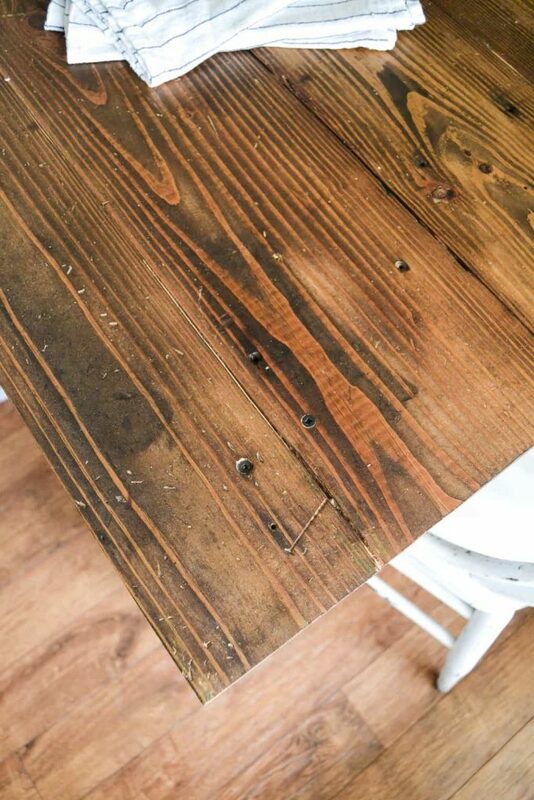 Our first DIY farmhouse table was a success. Our friends have seen it and want to be know when we make more so I see more farmhouse tables in our future. What kind of table does your family gather around? 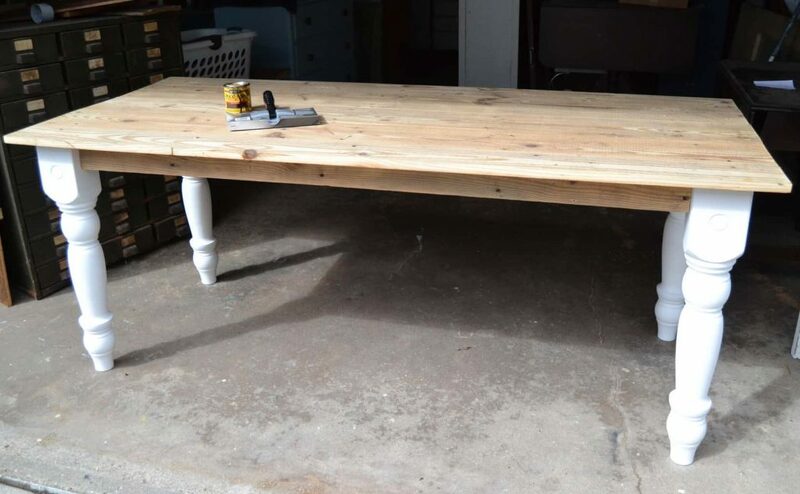 You no longer have to wait for your farmhouse table, you have made one. The table is absolutely gorgeous! 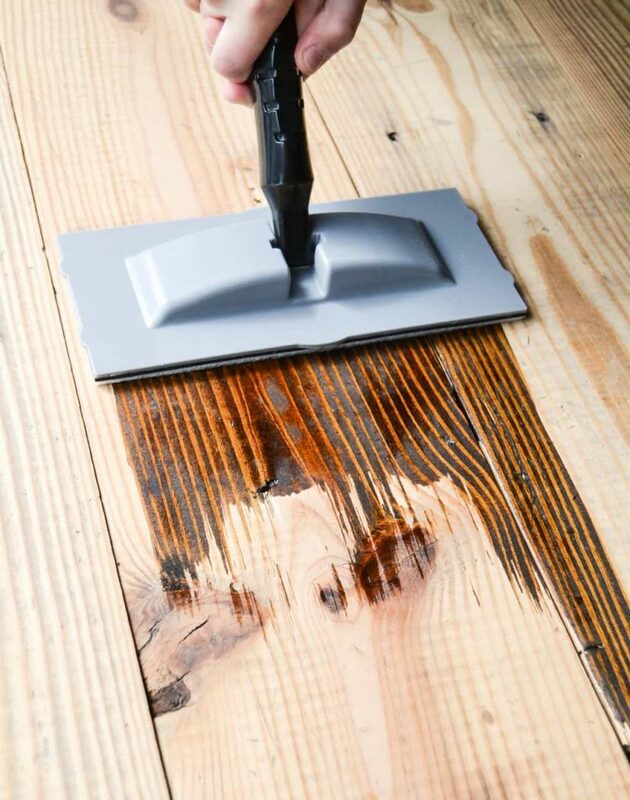 Did you seal your table top? I used stain that had poly in it. It has held up so well!